For October exceptionally I have chosen two Wines of the Month - one white and one red. This month I celebrated a very significant birthday with a lunch in a local restaurant to which all my relations and friends were invited. I chose a restaurant that allowed corkage because I wanted to serve my choice of wines – and the still wines would be – as you’d expect – Pinotage. 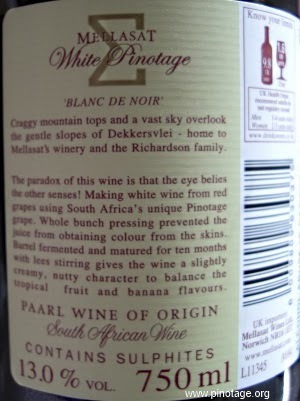 White was Enigma White Pinotage 2011 from Mellasat Vineyards in Paarl. 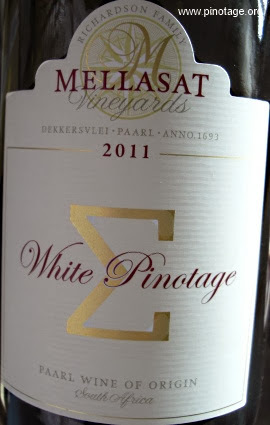 Mellasat made the first commercially available white Pinotage. It’s a most impressive wine and had guests puzzled – most thought it French and assumed it was a white Burgundy. The wine had wood aging with battonage and it’s complex and rewarding. The red was Kanonkop Estate Pinotage 2009. That year was one of the best vintages for a decade and it offered dense mulberry and blackberry flavours, yet I think with more time it will show even better than it is now. The day was a great success and a considerable amount of wine was consumed and new converts to Pinotage were made. Great selection, great tips, thanks for sharing these with us! Your blog has always entertaining stuff, thanks for sharing! Cheers! Great links to the pinotage books. I will definitely check them out.